North Butler Community Schools and Clarksville Community Schools in Iowa are introducing classes in firearms safety for 7th and 8th graders starting this spring. Butler County Conservation will be teaching a mandatory course in hunter safety through the physical education curriculum, the website Radio Iowa reported. High school students in grades 9-12 will also be able to receive the training, but it is not mandatory. Joel Foster, superintendent of North Butler Community Schools and Clarksville Community Schools, told Radio Iowa that the course was designed for the safety of students and staff. Foster told the news outlet that he knows not every student will become a hunter. But he wants to expose all students to firearm safety, a skill they can use for hunting or protection. Parents who oppose the course can sign a form to opt-out their child. Operable firearms and live ammunition will not be used during the course, the report stated. The Center for Injury and Research Prevention notes that most unintentional shooting deaths (about 89 percent) happen in the home. Many occur when children are playing with a loaded gun while their parents are not home. The Clarksville Community School District is located in Clarksville and North Butler Community Schools is headquartered in Allison. Both are located in the northern portion of Iowa. (CNN) President Donald Trump spent Thursday grappling with how to prevent more school massacres and address the gun debate gripping the country, offering solutions such as giving bonuses to teachers who undergo gun training. “I don’t want teachers to have guns. I want certain highly adept people — people that understand weaponry, guns. If they really have that aptitude — because not everybody has aptitude for gun — but if they have the aptitude, I think a concealed permit for having teachers and letting people know that there are people in the building with guns, you won’t have — in my opinion — you won’t have these shootings,” the President said. Gun-free zones, meanwhile, are appealing to criminals, he said. “We have to harden those schools, not soften them. A gun-free zone, to a killer, or somebody that wants to be a killer, that’s like going in for the ice cream. That’s like saying, ‘Here I am, take me,’ ” Trump said at the White House. He also disparaged school shooting drills, saying they were tough on the kids. Trump also promoted the idea of increasing the age limit of those who can purchase semi-automatic rifles from age 18 to age 21 as well as looking at the possibility of committing people like the Florida shooter to mental institutions. “I said this yesterday when we had a mental institution where you take a sicko like this guy — he was a sick guy, so many signs — and you bring him to a mental health institution, those institutions are largely closed because communities didn’t want him,” Trump said. The President also blamed violence in video games and movies as partly responsible for shaping young people’s thoughts. “They’re so violent,” Trump said. Prosecutors say a man accused of abusing children at a New Mexico compound linked to ‘extremist Muslims’ was training them to carry out school shootings. The father of a missing 3-year-old who was arrested at a New Mexico compound linked to “extremist Muslims” last week was training children to commit school shootings, court documents filed on Wednesday revealed. Prosecutors allege Siraj Ibn Wahhaj, 39, was conducting weapons training on the compound, where 11 children were found hungry and living in squalor. They asked Wahhaj, who appeared in court on Wednesday, be held without bail. Wahhaj is the son of a Brooklyn imam, also named Siraj Wahhaj, who was named by prosecutors as an unindicted co-conspirator in the 1993 World Trade Center bombing, the New York Post reported. Authorities raided the compound on Friday after a monthslong search investigating the disappearance of Abdul-ghani Wahhaj, a boy with severe medical issues who went missing from Georgia in December. On Monday, a child’s remains were found on the property, but authorities were working on a positive identification and did not confirm if the remains were that of the missing boy. Lucas Morton, Jany Leveille, 35, Hujrah Wahhaj, 38, and Subhannah Wahhaj, 35, were also arrested on the property on Friday and all face child abuse charges. The makeshift compound — located near the Colorado border — was found shielded by old tires, wooden pallets and other debris. Upon authorities’ arrival, Wahhaj was “heavily armed with an AR15 rifle, five loaded 30 round magazines, and four loaded pistols, including one in his pocket when he was taken down,” Taos County Sheriff Jerry Hogrefe said. The only food investigators found were some potatoes and a box of rice inside a dirty trailer, the sheriff said, adding that the living conditions were “the ugliest looking, filthiest” he’s ever seen. In a warrant made public on Monday, Wahhaj told the missing boy’s mother that he wanted to perform an “exorcism” on his then-3-year-old son because he was “possessed by the devil.” The missing child reportedly suffered from seizures and couldn’t walk. Wahhaj’s family background was already controversial prior to his arrest. In addition to his father reportedly being named by prosecutors as an unindicted co-conspirator in the 1993 bombing, the elder Wahhaj, who heads Masjid At-Taqwa mosque, was a character witness in the trial for Sheik Omar Abdel Rahman, the notorious “blind sheikh” who was convicted in 1995 of plotting terror attacks in the U.S.
Fox News’ Katherine Lam and The Associated Press contributed to this report. The Navy has taken on a new recruit, and he certainly has the enthusiasm and drive required to do his patriotic duty. This little chap takes to the sea like a pro, his flippers are tough and sturdy, and he appears to have a great rapport with his fellow naval officers. 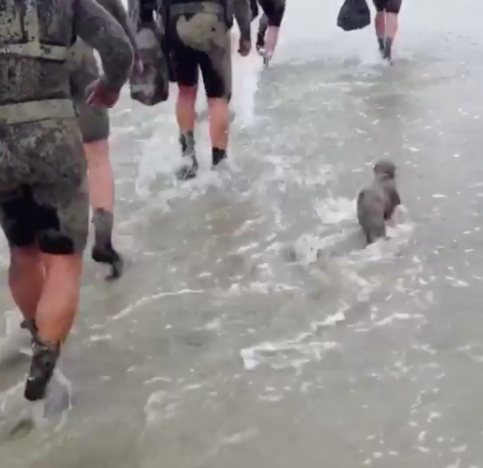 Yes, this new recruit may be a seal, and he may not wear a uniform over his slippery, naked form. But he’s a damn good soldier; eager to wade on his belly through freezing sea waters to prove himself to his two legged brothers in arms. Mr Seal, sir, we salute you. War Office Productions have uploaded an extremely adorable video to their Instagram page, with the caption ‘Show ‘em how it’s done.’ This may well be the cutest seal related content you will see today. In the footage, we can see a band of tough US Navy officers taking part in a gruelling military exercise. Caked in sand from the beach, they push onwards into the iron grey of the sea. And they aren’t alone. Flipping and flopping along beside them is an excitable little seal, who could not be happier to be joining in with the exercise. This keen to please recruit is all of us on the first day of a new job, and the internet has taken him straight to our collective heart. Why is this the cutest thing I’ve ever seen? It’s like he wants to be just like you guys. Like little bro walking big brother to the bus stop. Many people enjoyed the double meaning here behind the term ‘Navy Seal.’ Now if – like me – you thought Navy officers were called as such because of their swimming capabilities then this is apparently not the case. This is actually abbreviated from The United States Navy’s Sea, Air and Land Teams, which is a bit more of a mouthful. It is perhaps unsurprising this seal wanted to get in on the action. Much like dogs, these creatures are known to be highly intelligent, with an inquisitive nature. They are very curious too which is why they will follow boats to see what is going on aboard them. This is a great way for those people on these ships to get to see the seals up close in their natural environment. Wild seals are very intelligent, curious and have good coordination, learning tricks easily in captivity. 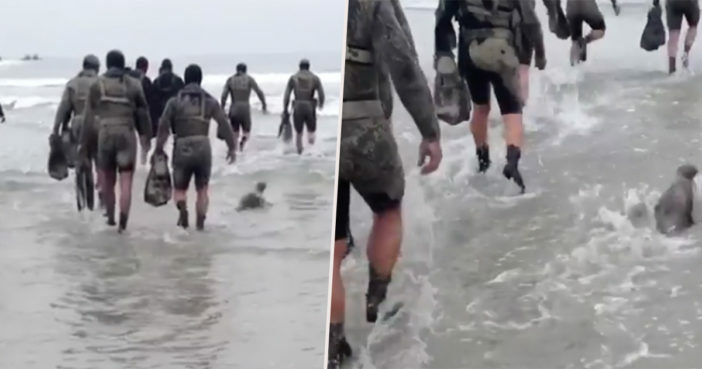 They are highly curious and instinctively protective – there was even a case reported of a seal coming to the rescue of a drowning dog. Sound like a useful guy to have on board. And to be fair, the lads couldn’t wish for a better swimming instructor. Just look at the speed on the little fella, very impressive indeed!